Boredom is one of those things that can easily turn into frenzied activity in my case. Some background: I was an avid sketcher on pretty much anything made of paper while I was growing up. I was actually thinking seriously about entering the comic book artist field at one point, but then my dad reminded me how "much" a comic book artist makes, which cemented my computing career. Still, up through high school (and a much lesser degree, college) I did a lot of drawing. Some of my less demanding HS classes generated more drawings in my notebooks than actual notes. So about a week ago I recaught the bug (which had been percolating for a long while, to be fair) to take up drawing again, but this time to do it right as regards equipment and time, and possibly go all the way to pastels and the like. You know, color. 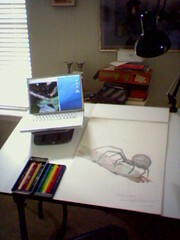 So the photo here is of my shiny new drawing desk, canted to a nicely rakish angle. I woke up wanting to draw a black widow spider, and so, after a brief Google Image Search for a suitable photo, I did. :-D You've got to love a creative use for the laptop stand I grabbed on a whim a few weeks ago. Medium: graphite pencils for the black & white, and Prismacolor lightfast colored pencils for the admittedly less interesting color bits. On a less wonderful note, as I was unloading the desk from the Altima yesterday evening, I rolled my foot off the edge of the concrete slab that is the floor of my garage, and sprained my left ankle something fierce. Yes, Matt, just like I did back on Super Bowl Sunday in your garage, only more thoroughly. I haven't undertaken a new quixotic, faintly counterculture endeavor for a while. I'm seriously thinking about learning to type on a Dvorak keyboard. I learned how to tap-type pretty quickly with a Fitaly PDA keyboard a year or two ago, so in theory learning Dvorak might not be too bad. Lots of devotees say they have no trouble switching their typing from Qwerty to Dvorak and back after learning. A busybody friend of a friend of mine from work is attempting to set me up with a friend of hers tonight. It will be a group of five of us (the matchmaker, the work friend, myself, and two friends of the matchmaker's) talking over wine at a local restaurant. Might be fun, might be a little oversaturated. We shall certainly see. It's been a while since I was introduced to a lady sight unseen. At least the restaurant is heavily reputed to be good. First, yes, I have survived the rampaging of Arlene, the non-storm. To be fair, she did knock out my power for several hours Sunday morning, which has never before happened to me in Alabama. It's been a good few weeks. I'm still loving the Altima. I'm getting all sorts of use out of the XM radio I plugged into it, and discovering a love for Jazz that I didn't know I had. Work has been sort of slow as deliberately, deliberately we circle the next big version of the application I've been working on: meetings, documentation, much beating about the bush. It looks as though we're finally going to get moving on it soon--here's hoping! Life after Leslie has been...okay, actually. Things were up in the air between us for long enough that any shock at parting seems to have been absorbed long ago. I certainly have more time to myself. I've even been on a date or two! My first initial feelers into the Birmingham online dating scene were met with some enthusiasm, actually (it's nice finally to be on the positive end of the men-get-more-distinguished-with-age cliché), but it remains to be seen whether I've crossed quite enough post-Leslie water to be plying new relationship seas just yet. Still, it's good to be out and meeting people.